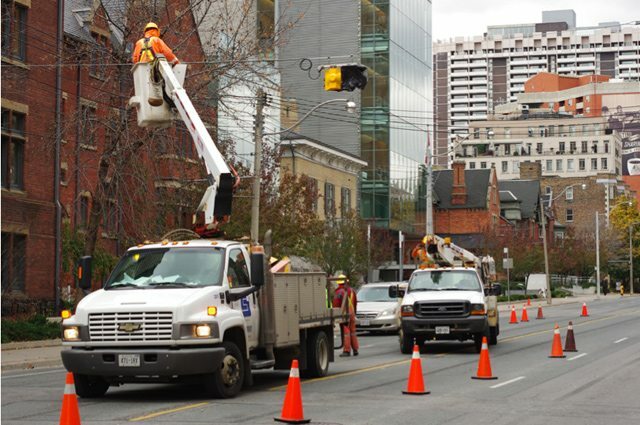 Since this morning, flashing cameras and microphone-wielding reporters have been stalking the southerly progress of a single power-scrubbing vehicle (official name: Stripe Hog) as it makes its way down Jarvis Street. It has been in the noisy, grating business of what our current government might call an act of pragmatism: power-washing away the bike lane on Jarvis. 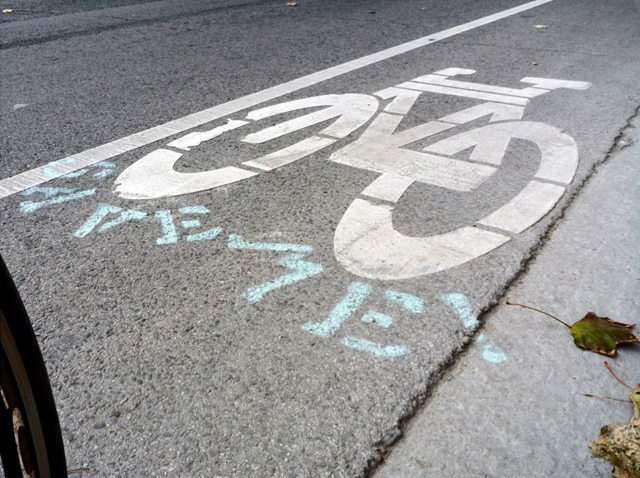 In the minds of many, however, it is power-washing away progress, and Toronto’s cyclists weren’t about to passively watch a cherished piece of local infrastructure vanish. 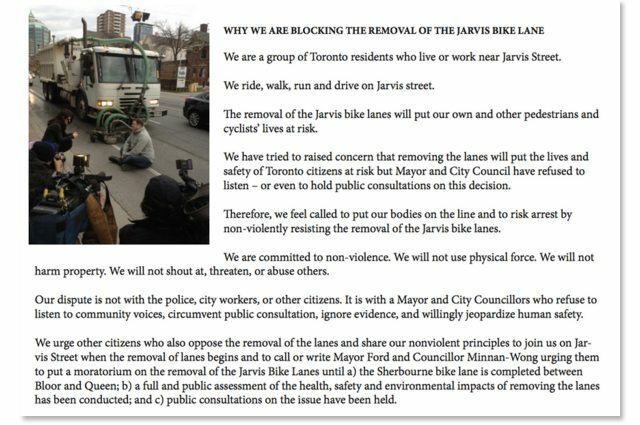 Alerted to this morning’s operation by the Jarvis Taskforce, a local pro-Jarvis advocacy group, some cyclists took the lane to protest its removal—not by riding in it, but by sitting in the path of the work crew. They’ve been at least temporarily successful: the truck has left Jarvis, work incomplete, and is scheduled to return tomorrow. Activists have planned further action on Jarvis, starting with a 5:30 p.m. vigil at the intersection of Jarvis and Wellesley tonight. They say they’ll be back on the street tomorrow before the scrubbing truck returns. Work crews installing lights for the returning reversible fifth lane on November 6. 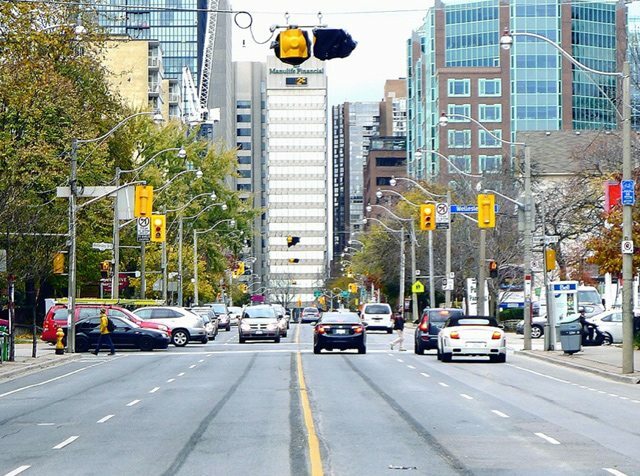 Though the decision to remove the bike lanes was justified by a need to ease congestion and smooth the flow of car traffic, elsewhere along Jarvis the installation of new parking meters promises an altogether different use of that space. Having heard as much as we have from our government about “gridlock” on the street, one could forgive Toronto’s cyclists for feeling more than a little insulted this afternoon.